The Tarot Card for January is the Star. The Star is also referred to as Hope as well as the Celestial Mandate. The Star is the Seventeenth of the Major Arcana in Tarot. The Star is associated with the planet Uranus, the element of Air, and the zodiacal sign of Aquarius. The Star represents hope, spiritual insight, liberation, and inspiration as well as reconnecting one's soul to the DIvine. As this card represents hope, it also teaches patience; patience that destiny, fate, is always at play. 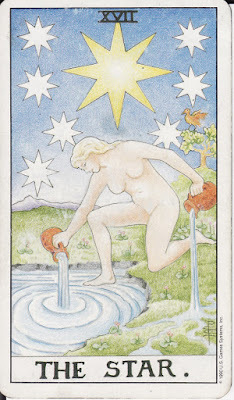 The Star card is depicted as a naked woman kneeling at the edge of a small pond with one foot on the ground and one in the water. 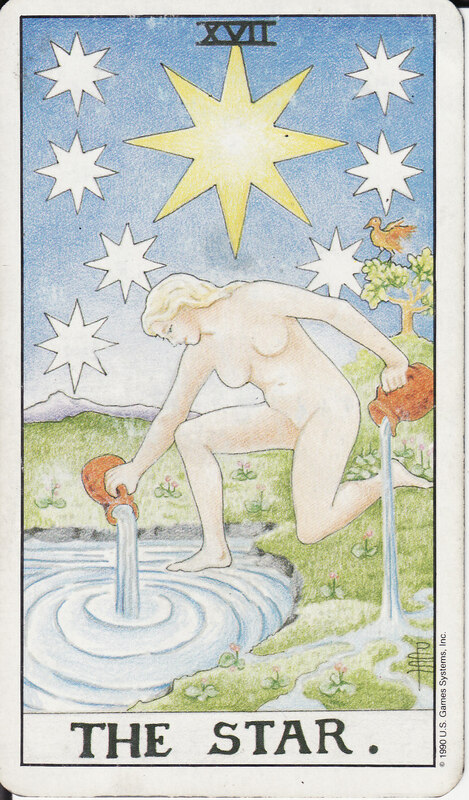 She pours water from a jar in both of her hands; one jar is pouring onto the land and the other into the pool. The water poured onto the dry land drains into five rivulets. Behind her is a tree with a bird standing on its top. Above her is depicted a starry night: one giant golden star surrounded by seven smaller stars. The naked woman is said to symbolize the soul and the containers symbolize the heart. Her nakedness represents that she has nothing to hide nor is she burdened by materialism nor is she ruled by fear. Her standing with one foot in the water and one on land shows her balancing between worlds, the material and spiritual, the conscious and the unconscious. Stars hold a plethora of symbolic meanings. Stars are associated with magic and luck ("to wish upon a star"). Stars also serve as guides as travelers, whether on land or sea, use the stars to help guide their way at night. A star led the three magi to the newborn Messiah in the New Testament. To be “born under a star” means to have good luck. In modern culture, to be a "star" is to be considered famous and/or talented. Polaris, the north star, holds a constant position at due north which makes it an easy landmark for those trying to determine their direction. To some, stars are divine guardians or represent divine beings; this can be seen in Christianity as Christ refers to himself in Revelations as the Morning Star. In some cultures, stars were seen as souls of those who have departed this world. Trees are often used to represent a medium through which realms communicate to each other (The Sephiroth in the Kabbalah or Yggdrasil in Norse mythology) and the bird is seen as a divine messenger.